When I was 20 years old, I flew for the first time in my life. It was a solo trip to New York. My uncle paid. It was awesome. In the 10 years or so that have passed since that trip, I have travelled to plenty of amazing locations around the world and have realized one indisputable truth: travelling is expensive. Even when it’s cheap, it’s sooexpensive. This realization led me to my next truth: seeing the world doesn’t always mean travelling further than your own backyard. This summer, I decided not to take one long vacation somewhere abroad. Instead, I decided to focus on seeing more of British Columbia. 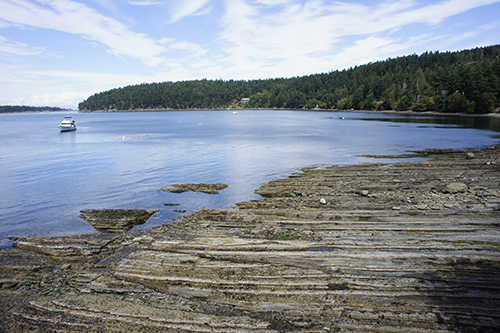 Over three weekends in July and August, I visited Victoria, Sechelt, and Mayne Island, which resulted in three very different vacations. Having partially grown up in Victoria, the majority of my weekend away was spent being the tour guide to my partner as we checked out all the beautiful sights and walked around the downtown core. However, when we decided to visit Sooke Harbour House for our anniversary dinner, I found a location on the island that I had zero experience with. As a kid, I had visited Sooke many times to go cliff diving and swimming at Sooke Potholes (which I highly suggest if you’re ever in the area), but fine dining definitely wasn’t on the menu. Things have changed. Considered one of Canada’s top tier restaurants, Sooke Harbour House is world-renowned for its locally sourced (in many cases from their own gardens) cuisine. 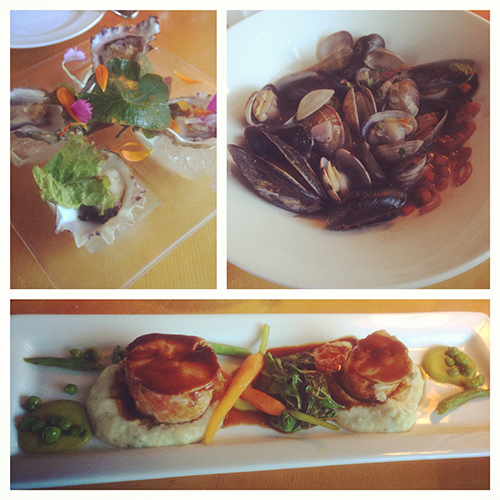 The food was amazing, the view was spectacular, and the atmosphere was peaceful; it was a welcome change of pace. 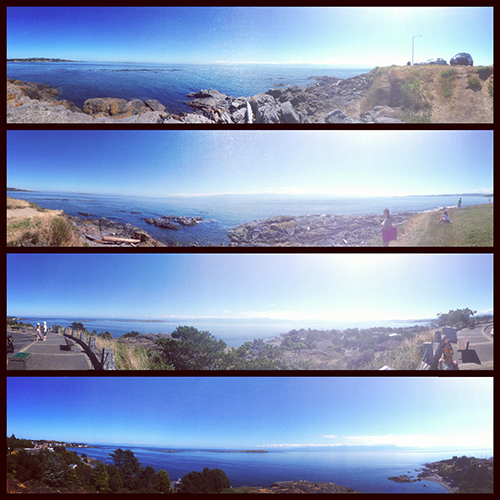 Definitely worth the forty-five minute drive if you’re ever in Victoria. We spent our weekend on Sakinaw Lake, getting away from civilization with some good friends. Boat access only, completely off the grid, no cell reception; it took some getting used to. A fifteen-minute boat ride across the lake and a ten minute hike through the forest later, we arrived at the ocean, where we hunted for mini-crabs to pass the time. Further from shore, we found some fairly sizable oysters. The oysters became a great pre-lunch snack the following day, although we decided to let the crabs go. The remainder of the trip was spent relaxing on the dock, dipping our feet in the lake and getting far too much sun. If I felt relaxed in Victoria, in Sechelt I was pretty much comatose. It is amazing how far from civilization you can get with a forty-five minute ferry ride and hour long drive. I’m not going to lie; the cabin we visited in Sechelt was a bit dodgy. Still under construction, all manner of wildlife encroaching on our personal space, and eerily quiet at night, so I had my reservations the following weekend when we visited Mayne Island. 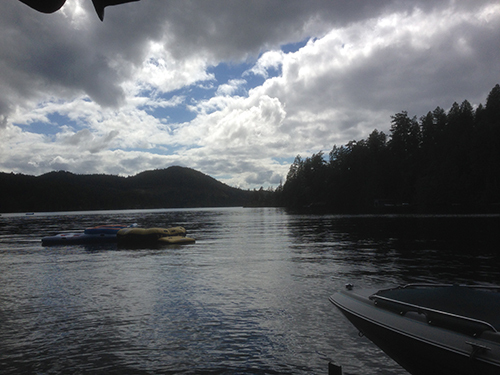 Village Bay, Mayne Island, B.C. We passed rickety shack after rickety shack until we finally arrived at the highest point on the island. We found out we were staying in one of the nicest cabins on the island—calling this place a cabin is like calling my condo a cave. 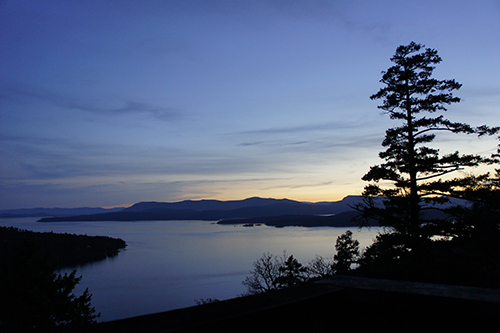 View from the hot tub, Mayne Island, B.C. Our trip to Mayne Island really was the perfect combination; close enough to the city that you don’t spend all day getting there, far enough that you can see the stars at night; the absence of many, but not all, creature comforts and modern conveniences; and finally, easy access to a town, with restaurants to visit and sights to see. 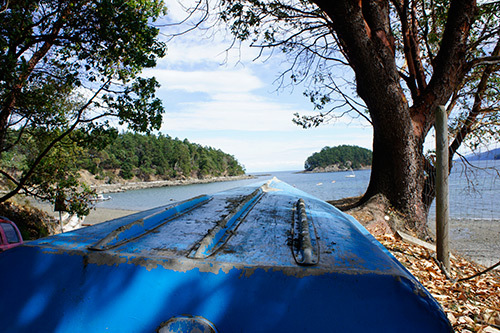 Bennett Bay, Mayne Island, B.C. There is still so much of this world that I want to see, so many amazing places to visit and people to meet, but once in a while, “getting away” can be accomplished by simply taking some time to explore your own backyard. I promise, there are just as many amazing people to meet, experiences to have, and pictures to take, within a two to three-hour radius of your front door. Sean is the Digital Platforms Director at TuGo; you can catch him in the winter checking out his province on top of a snow covered mountain with a snowboard under his feet.